BREASTPLATE OF THE HIGH PRIEST "ḥoshen"). The Stones of the Breastplate. Order of the Names on the Stones. A species of pouch, adorned with precious stones, worn by the high priest on his breast when he presented in the Holy Place the names of the children of Israel. 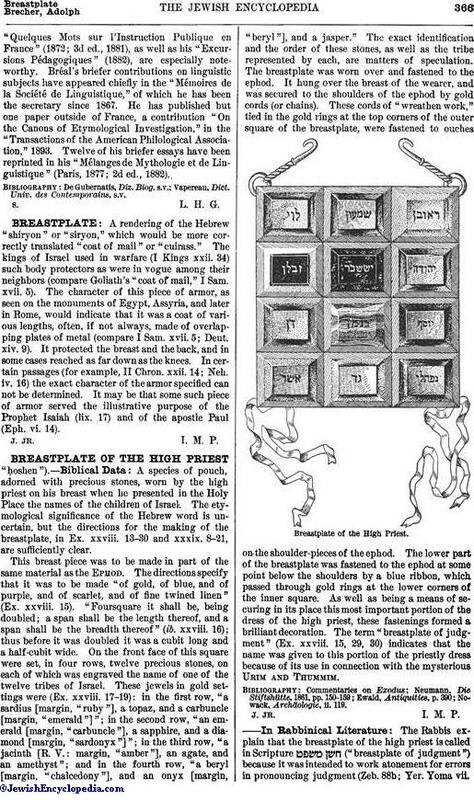 The etymological significance of the Hebrew word is uncertain, but the directions for the making of the breastplate, in Ex. xxviii. 13-30 and xxxix. 8-21, are sufficiently clear. This breast piece was to be made in part of the same material as the Ephod. The directions specify that it was to be made "of gold, of blue, and of purple, and of scarlet, and of fine twined linen" (Ex. xxviii. 15). "Foursquare it shall be, being doubled; a span shall be the length thereof, and a span shall be the breadth thereof" (ib. xxviii. 16); thus before it was doubled it was a cubit long and a half-cubit wide. 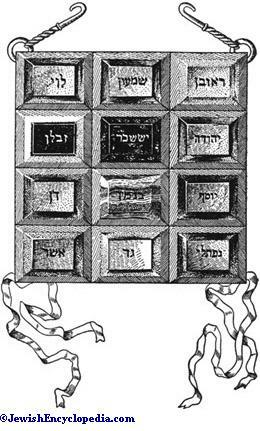 On the front face of this square were set, in four rows, twelve precious stones, on each of which was engraved the name of one of the twelve tribes of Israel. These jewels in gold settings were (Ex. xxviii. 17-19): in the first row, "a sardius [margin, "ruby"], a topaz, and a carbuncle [margin, "emerald"]"; in the second row, "an emerald [margin, "carbuncle"], a sapphire, and a diamond [margin, "sardonyx"]"; in the third row, "a jacinth [R. V.: margin, "amber"], an agate, and an amethyst"; and in the fourth row, "a beryl [margin, "chalcedony"], and an onyx [margin, "beryl"], and a jasper." The exact identification and the order of these stones, as well as the tribe represented by each, are matters of speculation. The breastplate was worn over and fastened to the ephod. It hung over the breast of the wearer, and was secured to the shoulders of the ephod by gold cords (or chains). These cords of "wreathen work," tied in the gold rings at the top corners of the outer square of the breastplate, were fastened to ouches on the shoulder-pieces of the ephod. The lower part of the breastplate was fastened to the ephod at some point below the shoulders by a blue ribbon, which passed through gold rings at the lower corners of the inner square. As well as being a means of securing in its place this most important portion of the dress of the high priest, these fastenings formed a brilliant decoration. The term "breastplate of judgment" (Ex. xxviii. 15, 29, 30) indicates that the name was given to this portion of the priestly dress because of its use in connection with the mysterious Urim and Thummim. Breastplate of the High Priest. The Rabbis explain that the breastplate of the high priest is called in Scripture ("breastplate of judgment") because it was intended to work atonement for errors in pronouncing judgment (Zeb. 88b; Yer. Yoma vii.44b; compare also Targ. Yer. to Ex. xxviii. 15; Philo and the Septuagint have instead of the Greek λόγιον or λνγεimacr;ον, which example Rashi follows in the passage to Ex. l.c., translating by "raisonnement"; similarly also Tobiah b. Eliezer, in Leḳaḥ Ṭob on the passage). Aaron and his successors wore the breastplate on the heart (Ex. xxviii. 29) as a reward, because Aaron was "glad in his heart" (Ex. iv. 14) when Moses returned to Egypt, and was not envious because his younger brother was chosen by God to deliver Israel (Shab. 139a; Ex. R. iii., end). According to the Talmud, the breastplate was made of the same material as the ephod and in the following manner: The gold was beaten into a leaf and cut into threads; then one golden thread was woven with six azure ( ) threads, and another golden thread with six purple ( ) threads, and similarly with the scarlet wool ( ) and the byssus. Thus there were four combinations of six-fold threads, with one golden thread woven through each; and, when these were twisted together the strand consisted of twenty-eight threads (Yoma 71b). The breastplate was fastened to the ouches ( ) of the ephod by means of threads of woven gold, passed through rings attached to the right and left of the upper part of the ephod. Furthermore, two rings were attached to the lower ends of the breastplate, from which azure cords passed through two rings at the lower points of the two shoulder-bands of the ephod, where they joined the girdle; so that the lower part of the breastplate was connected with the girdle of the ephod, and could neither slide up nor down, nor be detached (Rashi to Ex. xxviii. 6, in many editions also at the end of Ex. ; Maimonides, "Yad," Kele ha-Miḳdash, ix. 6-9). The twelve precious stones with which the breastplate was decorated contained the names of the twelve tribes; each name being fully engraved on one stone, in order that, when the high priest came before Him, God might be mindful of the piety of the patriarchs (Ex. R. xxxviii. 8; Lev. R. xxi. 6). No chisel was to touch the stones, nor was it permitted to mark the names of the twelve patriarchs on the stones by means of paint or ink. The engraving was done by means of the Shamir, which was placed on the stone, and had the marvelous power of cutting it along the lines of the letters of the proper names, which were first traced with ink (Soṭah 48b). In addition to the names of the twelve tribes, the stones also contained, at the head, the names Abraham, Isaac, and Jacob, and at the end the words: "[all these are] the tribes of Jeshurun" (Yoma 73b, where the first two words are not found, while Yer. Yoma vii., end, 44c has them, and also instead of ; Maimonides, l.c. 7, seems to have used a source differing both from Bab. and Yer., as his version has the words ="tribes of God"). 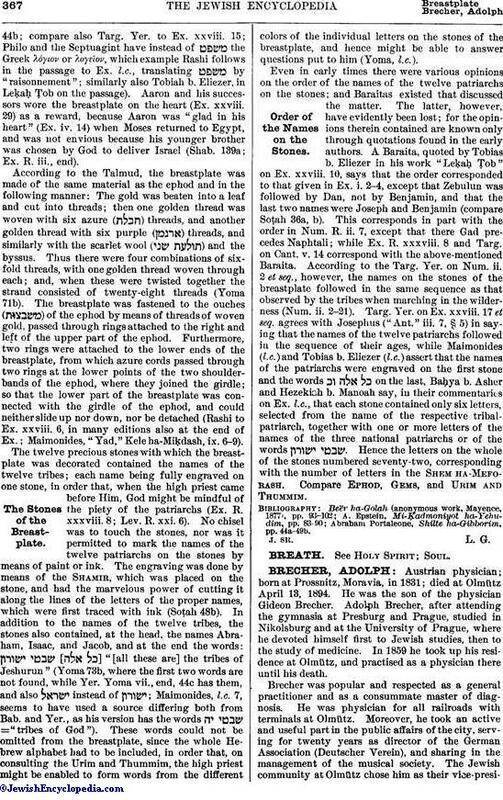 These words could not be omitted from the breastplate, since the whole Hebrew alphabet had to be included, in order that, on consulting the Urim and Thummim, the high priest might be enabled to form words from the different colors of the individual letters on the stones of the breastplate, and hence might be able to answer questions put to him (Yoma, l.c.). Even in early times there were various opinions on the order of the names of the twelve patriarchs on the stones; and Baraitas existed that discussed the matter. The latter, however, have evidently been lost; for the opinions therein contained are known only through quotations found in the early authors. A Baraita, quoted by Tobias b. Eliezer in his work "Leḳaḥ Ṭob" on Ex. xxviii. 10, says that the order corresponded to that given in Ex. i. 2-4, except that Zebulun was followed by Dan, not by Benjamin, and that the last two names were Joseph and Benjamin (compare Soṭah 36a, b). This corresponds in part with the order in Num. R. ii. 7, except that there Gad precedes Naphtali; while Ex. R. xxxviii. 8 and Targ. on Cant. v. 14 correspond with the above-mentioned Baraita. According to the Targ. Yer. on Num. ii. 2 et seq., however, the names on the stones of the breastplate followed in the same sequence as that observed by the tribes when marching in the wilderness (Num. ii. 2-21). Targ. Yer. on Ex. xxviii. 17 et seq. agrees with Josephus ("Ant." iii. 7, § 5) in saying that the names of the twelve patriarchs followed in the sequence of their ages, while Maimonides (l.c.) and Tobias b. Eliezer (l.c.) assert that the names of the patriarchs were engraved on the first stone and the words on the last, Baḥya b. Asher and Hezekiah b. Manoah say, in their commentaries on Ex. l.c., that each stone contained only six letters, selected from the name of the respective tribal-patriarch, together with one or more letters of the names of the three national patriarchs or of the words . Hence the letters on the whole of the stones numbered seventy-two, corresponding with the number of letters in the Shem ha-Meforash. Compare Ephod,Gems, and Urim and Thummim. Abraham Portaleone, Shilte ha-Gibborim, pp. 44a-49b.